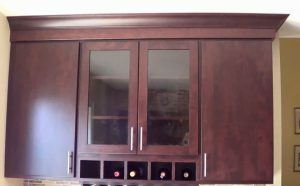 Often folks like the look of wall cabinets and crown molding going to the ceiling. It can make a room look larger — see photo below. Sometimes bringing the crown molding to the ceiling doesn’t look so good if your ceilings aren’t level. 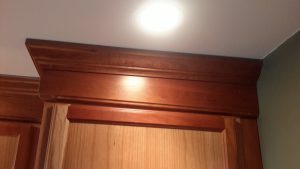 If cabinets are installed level and plumb (as they should), but your ceiling isn’t level, then the crown molding can travel up hill and look strange. Being a solid piece of wood, crown molding doesn’t have much flex to it. And sometimes dips and valleys in a ceiling are to large to using caulking to make them disappear. The photo below shows a piece of crown molding traveling up hill from left to right. 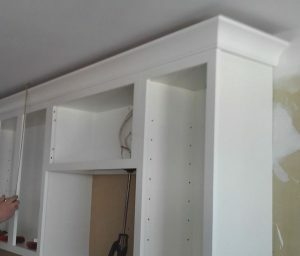 In this short distance, the slanted molding doesn’t stick out too bad. If this was a longer run of molding, then it wouldn’t look too good.